You can listen to 'Everything on wheels' here. As support act for Bettie Serveert awkward i was booked. A band I had heard of, even in a positive way, but never heard music of. At least not consciously. That was to change on this Wednesday evening. Before the show I saw Peter Visser of Bettie Serveert walk through the audience with a Viking helmet in his hand. He introduced Djurre de Haan and lay the helmet aside. It wasn't a prop for the show, so we may never find out what it was or is meant for. De Haan is sort of a Viking, longish blond hair and a blond beard, in appearance, not in presentation. The songs were introduced in a dry, tragic-comical way and a pattern became clear quite soon. A whole string of songs were played in which a woman fell from a roof, was hanging from a gallows pole, crashed in an airplane, etc. De Haan pointed it out to us as well, adding that as a person he had forgiven his ex-girlfriend, but as a singer-songwriter could not. awkward i performed as a solo artist. A man with his guitar, a few stomp boxes and a voice. This makes that there is not a lot to report on, but one thing stuck out to me. All the songs were very pleasant to listen to. 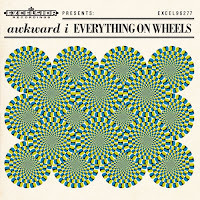 It made me buy the album, 'Everything on wheels', which I plan to blog on over the coming weeks. It made me curious how all this would sound on record. The music as played live makes it hard to picture an image of the music on record. On stage there were clearly influences of singer-songwriter, folk, pop and a faint hint at country. After a number played on a mandoline, De Haan said goodbye with a surprise: Carol van Dijk came on stage and together they sang a cover of a country song about Jesus. Acoustic at the side of the stage, with the audience very close around them. Their voices blended perfectly, as was also proven in the encore of the Bettie Serveert show in 'Had2B you'. Definitely asking for more. Who knows? Van Dijk has made records outside the Bettie Serveert format before.